The world’s oldest known submerged town has been revealed through the discovery of late Neolithic pottery, during an archaeological survey of Pavlopetri, off the southern Laconia coast of Greece. Dr Flemming is running the studies of sea-level change and tectonics at the site, while Dr Neil Wells of the University of Southampton’s School of Ocean and Earth Science and one of his students have already modelled winds and waves to work out aspects of coastal sand movement and erosion. 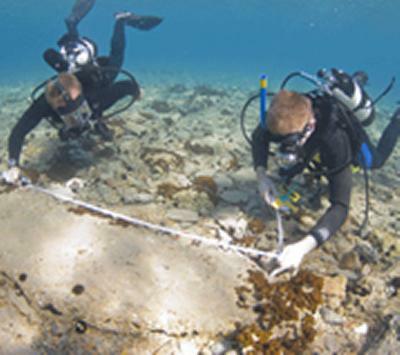 The project is being carried out by a multidisciplinary team, including Dr Flemming, led by Mr Elias Spondylis, Ephorate of Underwater Antiquities of the Hellenic Ministry of Culture in Greece and Dr Jon Henderson, an underwater archaeologist from the Department of Archaeology at The University of Nottingham. The underwater city was discovered by Flemming, then at the National Institute of Oceanography. He worked out that it was Bronze Age, about 2000 BC, and arranged the permit for a team from Cambridge University to map it properly in 1968, which they did using just snorkels and tape measures. The results were published by The British School at Athens in 1969, but no further work has been done over the last 40 years. The site was so remote that its isolation protected it from human interference, while a submerged ridge of rock protected it from erosion. Now in his 70s, Flemming has joined forces with archaeologists from the University of Nottingham and the Ephorate of Underwater Antiquities of the Hellenic Ministry of Culture as part of a five-year collaborative study of the site. The survey methods include laser range-finding on the surface and high-frequency sector-scanning sonar underwater. Their initial findings, and especially the discovery of Neolithic ceramics, mean that the submerged city was occupied at least 5,000 years ago, 1,200 years earlier than previously believed and perhaps based on a primitive settlement much earlier still. The findings have been made public by the Greek government. The total town area is about 100,000 square metres, about half of which has so far been mapped. Much is still covered by sand. The team has already found a new area of ruins, measuring about 100 by 100 metres. There is a lot more work to do in analysing the sand movements over the site, plotting various findings of submerged ‘beachrock’ which can be dated showing earlier shorelines now hundreds of metres offshore, and modelling the process of inundation itself. The Hellenic Centre for Marine Research plans to provide a geophysics research boat in 2010 to measure the sub-bottom profiles to get sediment thickness in key areas around the submerged city, and confirm the position of the shoreline at different dates. The permit runs for another four years.